'Whose Boat Is This Boat? Comments That Don’t Help in the Aftermath of a Hurricane' arrives on Midterms Day, Tuesday, Nov. 6. Our President says a lot of things. Some of those things could be construed as insensitive, especially after a powerful hurricane ravages the country. No judgments, Mr. President! But you certainly won't hold it against Stephen if he decides to announce a book comprised of said post-hurricane comments, authored by you—by accident. 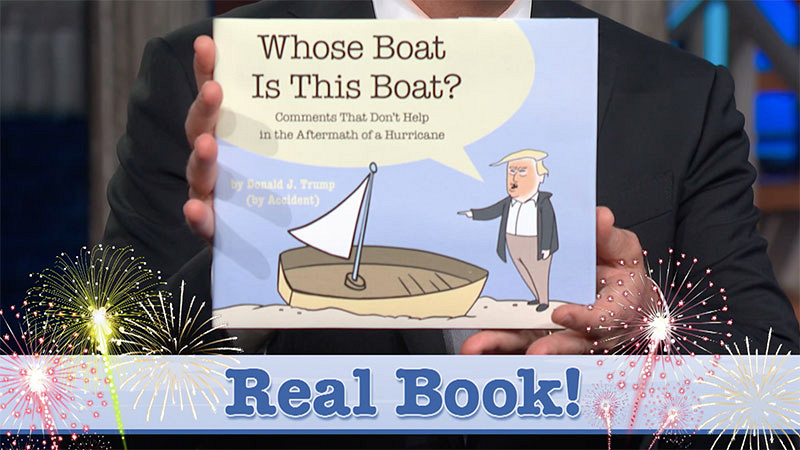 That's right, on The Late Show with Stephen Colbert, Stephen has announced a brand-new book, Whose Boat Is This Boat? Comments That Don’t Help in the Aftermath of a Hurricane, By Donald J. Trump (by Accident). Also known as: A compilation of things the President really said in the aftermath of Hurricane Florence. 100% of The Late Show proceeds go to hurricane relief, including Florida Disaster Fund, Foundation for the Carolinas, The One SC Fund, The North Carolina Disaster Relief Fund, and World Central Kitchen. Whose Boat Is This Boat? arrives on Tuesday, Nov. 6 (Midterms Day!). Or, you can pre-order your copy via Amazon, Barnes & Noble, or IndieBound.org.